The lights of Ventimiglia stretch out below, highlighting the grid of streets pressed along the coast. The ocean is dark, a wide black expanse stretched to the horizon save for a few ships floating across it, drifting like satellites in space. Menton and France wait in the distance along the curving coast of headlands, cliffs, and beaches. I think of Gotthard Pass, of that moment when I slipped through the Alps and reached the last bit of snow, when I knew I would reach Italy. I think of crossing the border along the mountain top at night, of waking at sunrise and seeing the ghost of Monviso hanging in the distance and those first steps on Italian soil. I think of Sarah and Francesco and how they made Italy come to life for me from New Year’s to the radio station to last night in their mom’s apartment along the coast. It didn’t matter where I was, they made sure I was well, they made sure I never felt alone. I think of Nikki in the radio booth and Tropical Pizza and how Davide saw me walking down the street, how I ended up on Daniele’s couch and sitting in a bar with Francesca and Enzo. I think of dinner with Cristiana, Marco, Rosina, and little baby Lorenzo who is exactly as old as this trip. I think of the elderly man I met in a field who spoke in gestures and the guys from the fruit stand who filled my hands with clementines when they learned I was walking to Spain. I came to Italy once in college. I went to Rome, Florence, and Venice. I saw cathedrals, paintings, and tried to sneak a picture of Michelangelo’s David when the guards weren’t looking. When I got home, I told people I’d been to Italy, but it was all teleporting between train stations, hotels, museums, and cathedrals, it was all a glossy magazine. This time I drew a line. 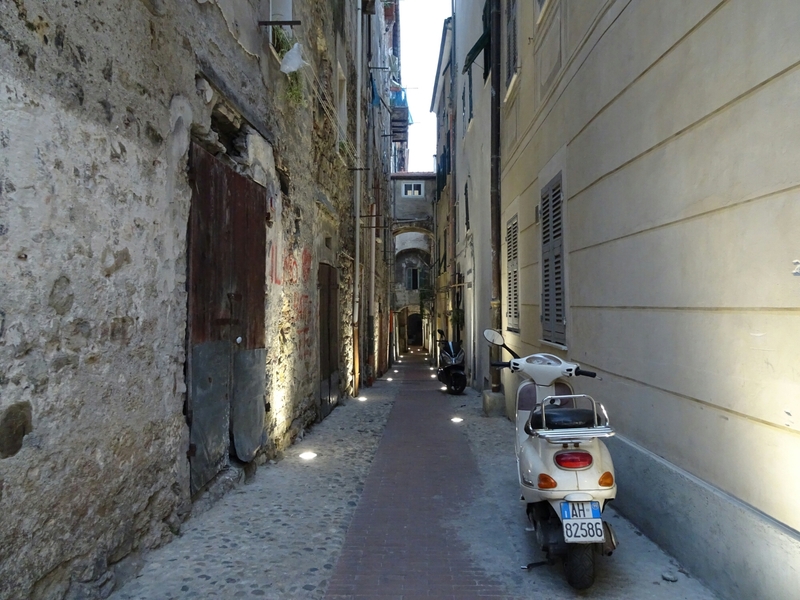 I walked old streets in beautiful towns and trashed up highways past abandoned buildings. I crossed land worth almost nothing and acres worth millions for the grapes growing in their soil. Some days the sun made me sweat. Others, my beard froze as I walked. I slept in houses and apartments, on top of mountains, under stars, by a levee, and in the dirt. I ate things I didn’t know existed and drank better wine than I should have. I met strangers in fields, by the side of roads, and on trails. At least three hundred dogs barked at me before I stopped counting and I suffered the stare of more than one Italian grandmother looking out her window and wondering what I was doing walking by on her narrow street. I didn’t set foot in a single museum and barely visited a church. But I did watch two old men almost fist fight over a card game on a Sunday afternoon. I still wouldn’t say I know Italy. I will never know Italy. But that line, I know that line. It’s no glossy magazine. There’s no Sistine Chapel or Pieta and the streets sometimes had a lot of trash, but it’s real and I love that line, flaws and all. Posted in Europe North to SouthTagged ENS, Europe North to South, featured, hiking, Italy, travel, travel vs vacationBookmark the permalink. Grazie, grazie and grazie to all who helped and took part of Daniel’s journey in Italy. The Italian warmth and passion is a pleasure to experience through Daniel’s blogs. Please come visit us in Florida! Many thanks to all who welcomed Daniel and shared the beauty of Italy and their love of life and friends!! Hope to meet you one day!! Sweet. I’m so glad that you got a chance to visit Italy in this way, walking the land, meeting the people one to one. What lovely friends you made, what sweet memories. It’s in your blood, you know, so that connection is sealed. Perhaps I will have the good fortune of going there again myself. Yes. You are seeing the real Italy on this journey. A unique story unfolds on every road and in every town when you meet the locals and make new friends.